We are collecting, collating and transcribing the men and women of the parish who gave the ultimate sacrifice in times of war. This list is not yet complete. If you have any contributions you can offer, we would be honoured to add them. Scotland's War is an Edinburgh University project to collect as many of the memories and memorabilia of Scotlands contribution to World War one .. both forces and at home. If you would like us to scan and photograph any items you have and send them on, we would be very happy to help. We have quite a few of the Commonwealth War Grave website records printed in a Roll of Honour file in the archive. 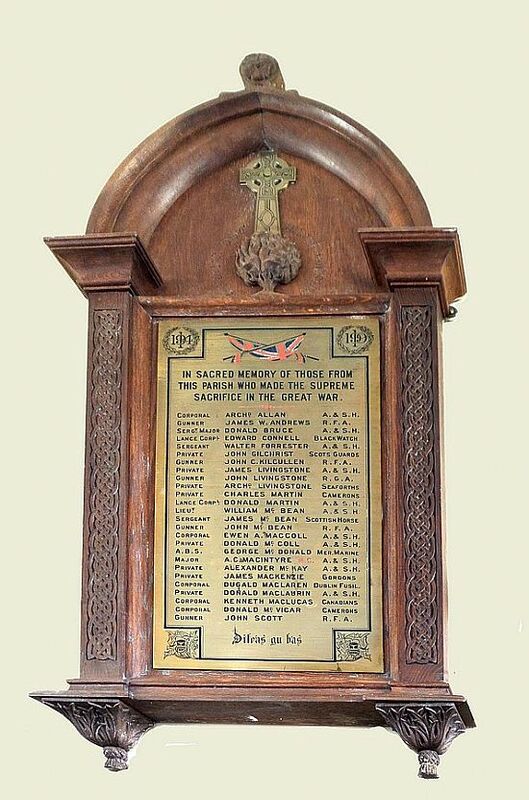 To recognise them, and to learn more about each, lets begin to collect the stories and family history of those of our parish who were involved in the military in the past. to do : create a page per person and link up the records. 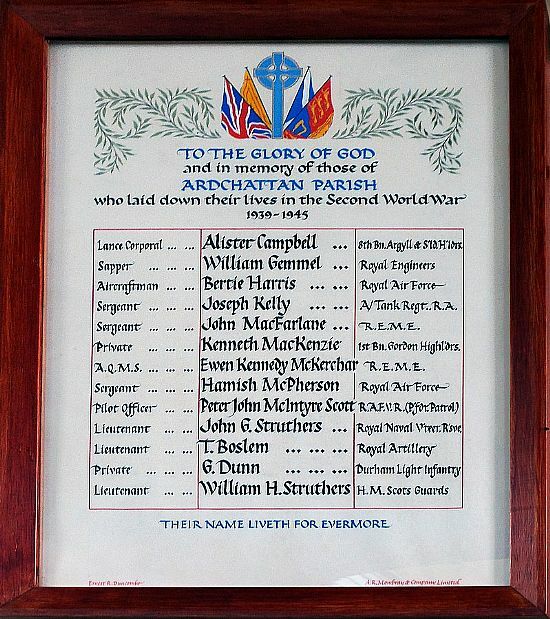 Paper records : Images of the Roll of Honour panels in Churches, and on any Memorial. Printed copies of most digital records. Stories, images and family histories of each man. Many of these men were working at Bonawe Quarries, they had come from outside the area, but are commemorated here. Of the men locally born and raised, quite a few were blacksmith and foresters sons. Rank:Serjeant Service No:1467446 Date of Death:19/07/1943 Age:24 Regiment/Service:Royal Artillery 61 Anti-Tank Regt. Grave Reference: II. F. 4. Cemetery:CATANIA WAR CEMETERY, SICILY Additional Information: Son of James and Mary Kelly, of Bonawe Quarries, Argyllshire.